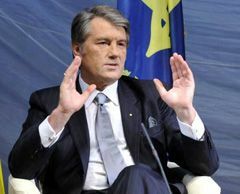 President of Ukraine Victor Yushchenko believes that issues of improving the relations between Ukraine and Russia lay in “the plane of democratization of the RF”. According to an UNIAN correspondent, he said this delivering a lecture about international position of Ukraine before lecturers and students of Kyiv International Relations Institute. According to his words, the difficulties of relations between Ukraine and Russia are because of the fact that the countries follow different directions and have different system of values. He reminded about the conflict between Georgia and Russia in 2008. The President repeated once again that “the main problem of relations is in the plane of democratization of Russia”. Ukraine is a good example how it is necessary to modernize a country and values. V. Yushchenko underlined that his opponents at the presidential election - Prime Minister of Ukraine Yulia Tymoshenko and leader of the Party of Regions Victor Yanukovych - will not respect a democracy and freedom of speech in the case they win at election of the head of the state. “Because they will not hold out on these principles – they profess the contrary things”, he said and noted that “we all will sing Nyurka or Murka, what do they sing there?”.